We are manufacturer, of Industrial Sand Screening Machine. 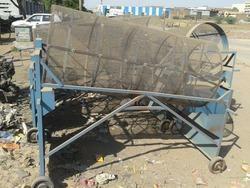 These machines are manufactured using superior quality raw material and modernized machinery. Our offered screening machine is stringently checked against various quality parameters to ensure its flawless quality. Quite popular in the business for its efficient performance and ease of operation, the proffered Vibratory Sand Screening Machine is vastly welcomed. Manufactured as per the industry norms, the selection is vastly used for sieving red soil and sand. Massively demanded at construction sites, the proffered range is appreciated for its reliable operations and minimal maintenance. We are counted as a prominent manufacturer and supplier of a premium quality Sand Screening Machine. This machine is manufactured using quality approved components and advanced technology under the guidance of dexterous professionals. Our quality controllers check this machine on several quality parameters to ensure its quality. Apart from this, our offered machine is broadly used to filter sand at construction sites. This machine is made available at an affordable price in the market. Looking for Sand Screening Machine ?